Hirose, a leader in the design and manufacture of innovative connector solutions, has designed a compact flexible printed circuit (FPC) / flat flexible connector (FFC) with a space-saving, low-profile design. Featuring a pitch of only 0.50mm, a height of 1.20mm and depth of only 3.57mm, the FH65 Series reduces the occupied mounting area by 47% (on average) with a weight reduction of 62% (on average) compared to previous technologies. Designed for automotive and other high-temperature applications, the highly reliable FH65 Series is resistant to extreme temperatures from -40 to 125 degree C.
The FH65 Series FPC/FFC connectors have a robust lock with a clear tactile click that confirms actuator locking. 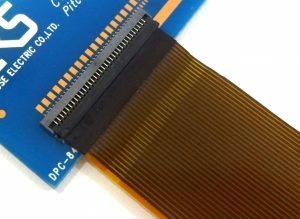 The design does not expose contacts on the bottom side of the connector, making the board area under the connector available for PCB pattern. The actuator is positioned so that solder tabs and terminals firmly retain the actuator, particularly ideal for high-vibration applications like automotive. The space-saving I-shaped solder tabs not only allow visual inspection, but also offer a high-retention force of 23N. With a wide 120 degree FPC/FFC opening and guided positioning, the user-friendly FH65 Series is easy to use. The FH65 Series connector is well suited for a wide range of automotive applications including camera, millimeter-wave radar, and heads-up display systems. The FH65 Series is currently available in a 34-position version. The connector meets halogen-free requirements and is RoHS compliant. The FH65 Series has a rated current of 0.5A, a rated voltage of 50V AC/DC, and a contact resistance of 50 milliohms.